After reading our posts, what is banner advertising? and does banner advertising work? and familiarising yourself with the common terminology of banner advertising, your business is ready. So – you are ready. But how can you make banner advertising work for you? Certainly, if you can partner with an agency or freelancer (or us!) to help you strategize and buy your ad space, do. Experience is well worth the money in this arena. But, if you are thinking you want to go it alone, here is what you absolutely must know about placing space. Your campaign can be broken down into two prime areas of consideration: The Strategy and The Ad. Start with your strategy, because until you know who your market is, what the specs are for the space you are buying, and what kind of budget you are working within, you can’t design an ad. You may be saying, “But I already know my market and I know my budget.” No, you don’t. What you know is your business’ market and your total marketing spend. The other two pieces will fall into place shortly, but not until after some work and research. Start off by defining your goals. What will make your campaign a success? Are there definite milestones you want to hit? Be specific. “More sales” and “Get new customers” are not actually goals; they are generalizations of success. Choose a milestone such as “Increase website traffic by 10%” or “Get 10 new inquiries”; you can then discover how much money you need to spend to achieve that goal and your strategies going forward can be much more accurate and directed. Next, get targeted. Where will you place your ad? Google? Facebook? Website.com? Take some time to brainstorm a bit and think about where you potential audience might be? Think outside the box to broaden the possibilities – a famous pizza chain found great success targeting hungry students by advertising on Dictionary.com. Once you have decided the best possibilities to place your ad, start the research – download the media kits or contact sales to get pricing and performance information. If you engage sales – don’t be embarrassed – tell them you are just trying this out and ask if they have any introductory offers or starter packages, as they often will run specials or give you a preferred rate the first time you place an ad. Biggest and most expensive aren’t always best, and a good campaign will likely have a mix of ad units and locations. Decide what is right for you, how can you use your budget most effectively, and how much do you want to spend where. You may decide on a single avenue or multiple, but take a moment to reassess that your goals and opportunities are aligned. Adjust what needs adjusting. Lastly, decide on a program that will allow you to sufficiently test your efforts (a single weekend will not provide sufficient data for any decision making – give it time – 3-4 weeks is best) and validate your decisions, and again, allow you to make adjustments where necessary. When you finally have a plan in place, you can start creating your ads – multiple ads, even if all you are doing is Google Adwords. Your ad may be just a matter of providing text and a thumbnail image or you may be required to provide a creative file based on specifications from the website owner/seller. Clear – one message, idea, or offer. Pictures should be easily digestible and relevant. Simple – can a child understand it? How few words can you use to get your idea across? Include a Promise to Deliver – why are they clicking here? For what? Click here… for more information, to register, to find out more, for your chance to win… you get the idea. Include a Landing Page/Destination URL – where the reader goes once they click your ad. This page is critically important, particularly if you want them to take an action such as registering for a newsletter or shopping a particular product or course. Except for rare occasions, this URL is almost NEVER your domain name, but rather, a sub-page thereof. Remember: less is more. If a stranger can’t understand everything there is to understand about your ad in under 2 seconds, your ad stinks. Start over. Finally, try A/B testing – for any space, create to similar but different ads – a different image, different call to action, etc. Place those ads to run against one another so that they are receiving the same time of day, the same days, etc – running concurrently on the same site. After 3-4 weeks’ time, compare ad metrics and learn from the data, rather than your instincts, to which ads people are responding best. As always, remember, advertising is a process. 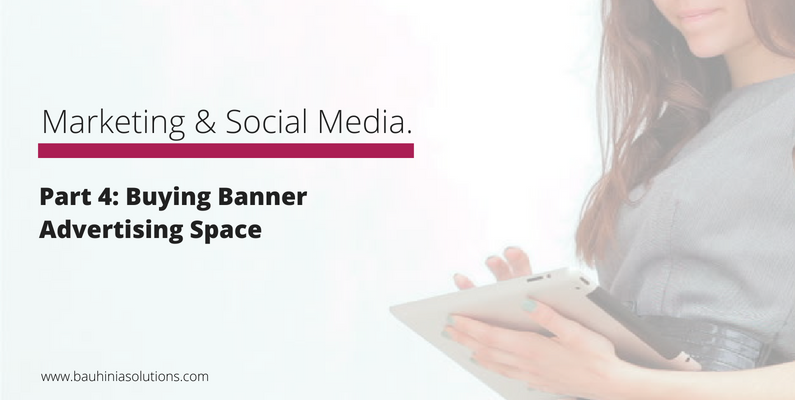 The internet is ever changing and always moving, and as such, so should your banner advertising strategy. There are visual trends, technology changes, traffic fluctuations, and new websites selling space. The sooner you accept that it is never ‘done’, the more successful your online efforts will be! Best of luck and let us know if you want some help. Elizabeth’s professional experience is well-rounded, with a deep understanding of digital marketing and advertising, digital publishing, new media, and sales. As a Business Specialist, she focuses on supporting the team and our clients in online advertising and analytics.